Roth, V. (2011). Divergent. New York, NY: Katherine Tegen Books. There’s no denying that dystopian stories have grown in popularity. Such stories have captured and engaged the avid and reluctant readers alike. Novels such as Veronica Roth’s Divergent series, like others in the genre of late have birthed high interest novels that reluctant readers want to read. The reluctant reader isn’t the only audience affected by the current dystopian genre craze, but extends to individual of all ages, gender, religion, and ethnicity due to the strong characters that “diverge” from societal norms common to this genre. Rather than longing for that which is out of their reach, these dystopian characters find the means to attain or fight for what they want or believe in. Whether a fictional dystopian society or reality, humanity in general, as it is in our nature, always longs for betterment of our circumstances. We often relabel that longing as hope or desire, and is often a combination of both intrinsic and extrinsic desires. Characters such as Tris (Beatrice Prior) in the Divergent series examples how her desire to stay safe evolves beyond just her family and faction, but to those she once considered her enemies. Realizing that selflessness is not without bravery allowed her to share the same belief as another divergent character, Four (Tobias Eaton), that all individuals possess all virtues characteristic to each and every faction… honesty (Candor), selflessness (Abnegation), intelligence (Erudite), peace (Amity), and bravery (Dauntless). 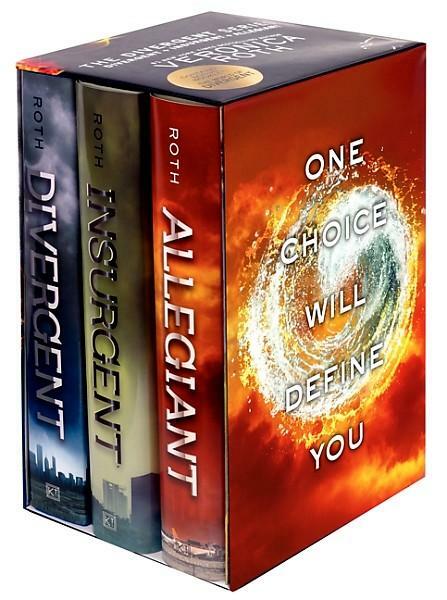 The Divergent series is a dystopian thriller of a society shrouded in secrecy. Though the books are told from the point of view of a female protagonist, these books should appeal to all genders alike. Each reader of the series will inevitably find a character they most closely identify with, and find encouragement in the choices made and wisdom discovered as they mature and diverge regardless of aptitude testing. The characters in Veronica Roth’s Divergent series have the ability to assist the reader to confront and possibly overcome their own difficulties by combining virtues the reader already has within themselves similar to the characters in the Divergent series. For some, the Divergence series may serve as a form of bibliotherapy, especially for those that struggle with fear. I found it interesting to discover that the divergence subject matter isn’t unique to only Tris and the Divergent series, but references to others, including those from Biblical times, can be read in the blog post Are you Divergent? located on the Jews For Jesus website. Lucas, G. (Producer). (2009). Star Wars, the clone wars: The complete season one. United States: Lucas Film Ltd. & Warner Home Video. Star Wars The Clone Wars: The Complete Season One package is a wonderful collector’s item. The disc case has the appearance of a high quality hard cover novel with 3 discs on inside of both covers and between is a 68-page booklet to tickle the fancy of any Star Wars geek young and old. The booklet is jam packed with original pre-production sketches in black & white and full color and corresponding artist notes. The discs include 22 episodes, 7 director’s cut episodes, 22 behind-the-scenes featurettes with director and cast interviews, and the Jedi Temple Archives which is a database of the initial animation process, concept art, and 3D turnarounds. If you’re getting a little bored of the Milky Way galaxy, then a “galaxy far, far away” with The Clone Wars is just what you need. The Clone Wars is produced by George Lucas and Lucasfilms. This is a spin-off series set between Episodes II and III of the live feature films and fits perfectly after Yoda’s comment to Obi Wan near the end of Episode II, “the shroud of the Dark Side has fallen, begun the Clone War has.” The clones have not yet become enemies of the Jedi, and the series begins as war is already raging between the Republic and the Separatists, the clones and the droids. The first episode will have anyone watching enthralled and laughing with the slap-stick humor of the droids and in awe observing everyone’s favorite Jedi Master Yoda needing piggyback rides and using a cane yet able to be victorious over an entire battalion of droids with his ever impressive Jedi acrobatics. And the viewer gets to meet Ahsoka Tano, a young light saber yielding girl with a quirky personality, dedicated heart, and Anakin Skywalker’s padawan. Anakin Skywalker (nicknamed “Sky Guy” by Ahsoka) is almost always accompanied by Ahsoka and Obi Wan Kenobi, offering characters of both genders and various ages that will easily appeal to tweens and those younger or older. The series offers plenty of options for discussion or personal reflection as each of the episodes begins with tidbits of Yoda wisdom. And though The Clone Wars and anything Star Wars is far from realistic, there are plenty of themes and lessons to learn from the show as the Jedi with the aid of the clone army try to return peace and order to the universe. Some themes that resonate strong are duty, morality, individuality, friendship, hatred, grief, segregation, secrets, and courage. The depth of the characters, animation design, foreshadowing, and intriguing and addictive storyline, will keep fans and those new to Star Wars wanting to own and re-watch each of the current four seasons already released on DVD and possibly books from DK such as; Star Wars The Clone Wars Character Encyclopedia, Star Wars The Clone Wars Visual Guide, Star Wars The Clone Wars Visual Guide Ultimate Battles, Star Wars The Clone Wars, Incredible Vehicles, and Star Wars The Clone Wars New Battlefronts The Visual Guide. If viewers are looking for an entirely new story featuring evil armies, royal twins, and a mysterious warrior destined to bring peace to the kingdom, they may enjoy the 26-episode anime series Guin Saga, or a world ravished by war between nations in which people can manipulate the elements in Nickelodeon’s series Avatar: The Last Airbender. This is a wonderful website with daily news that ranges from typical information regarding national and world current events from politics to the newest hit dance sensation as seen in the recent article featuring PSY and his hit Gangman Style. The website is available for students of the ages 8-18. The articles are chosen by tweens and teens and are most appropriate for the page they are highlighted on. Tweens and Teens are encouraged to comment on stories that offer a critical thinking question at the end of the story and even take quizzes. TweenTribune is a free online tool, offering daily news in social site format, and offers ample classroom curriculum options since student accounts requires one of their current teachers/librarian having an account so they can register, especially for those under the age of 13 who are commonly restricted from a lot of online social interactions are able to participate. Students that comment on articles and take quizzes will have their scores delivered to their teacher for grading if desired and comments for approval prior to publishing. TweenTribune is COPPA compliant. Submitted by remim-Sho on Monday, 12/03/2012 – 22:19. – There are three reasons why Gangnam style is a more popular song than Baby from Justin Beiber. One,is that Gangnam Style was an unprecedented event meaning it was never before known or experienced. Another reason Gangnam Style is better than (Baby) is because in Gangnam style as you are listening to the song,there is a dance that you can do. I do not think that Gangnam Style was mimicking Justin Beiber”s style by like putting it up their. One day ether one of theses pop stars can relinquish their career when ever they want to. And the last reason why Gangnam Style is better than Justin Beiber song is because when you listen to Gangnam style and you’re a guy you won’t feel like weird. On the other hand if you are a guy and you are listening to Baby by Justin Beiber you are gonna feel weird because Baby seems like a song more for girls. Submitted by Stephenb18 on Sunday, 12/02/2012 – 11:10. – I think gangnam style should be more popular than Justin biebers baby and I can give reasons why. I think that gangnam style is more popular because it has a good music video, a fun dance that goes with it, and it’s in Korean. Those are three reasons I think it is more popular. I also think that the fans for each video are different. I think they’re different because gangnam style managed to get more views then baby and baby came out earlier. Submitted by DanielS-G on Friday, 11/30/2012 – 07:47. – I’m undecided. I kind of think it is a good thing to have cursive memorized just in case you ever have to sign your name or your electronics shut down, but I think it may just be a complete waste of time. Cursive is much slower than typing and typing comes out easier to read. Submitted by kaylees12345 on Friday, 11/30/2012 – 14:45. – Honestly, I think that cursive shouldn’t be taught because it’s a waste of time! And it also hurts your hand…. Like, A LOT… Kids shouldn’t be tortured to learn this. It’s very annoying and everybody I know hates it…. Wait, no, scratch that… Strongly dislikes it…. No I’m going back to, everybody hates it. Submitted by HannahM7124 on Friday, 11/30/2012 – 14:41. – I think teaching cursive writing isn’t important. There are more important things to learn and if you spend time teaching cursive that’s time you have lost teaching topic or skills that will be a bigger impact on a child’s life. Some people may argue that cursive is a way to have a stamp of identity, but in my personal opinion there are better ways to express yourself like through art, speech, or music. TweenTribute offers students with current events with topics that go beyond classroom curriculum ensuring something will fancy their interest, get students reading, and hopefully participate. A paper magazine option is still available for subscription to TweenTribune, but the online version offers current news in real-time, and the discussions provides more than the paper version ever can by encouraging critical thinking, classroom use, a safe moderated environment, and exposure to the opinions and cultures from students from all areas of the globe as well as the intrinsic and extrinsic benefits of being a contributing member of society. Flackett, J. (Director), Levin, Mark. (Director), Bell, A.E. (Producer). (2008). Nim’s Island. [Motion picture]. United States: 20th Century Fox. Nim is an 11-year-old funny, energetic, adventurous, and self-sufficient little girl with a vivid imagination. Nim’s father, Jack Rusoe, relocates the two of them to a remote and secret island in the South Pacific after the death of his wife Emily, an oceanographer who died at sea. Jack is a marine biologist who writes articles for National Geographic. He spends his days in search of oceanic discoveries while Nim enjoys her adventures with her friends; Selkie, the sea-lion, a giant lizard, Fred, Galileo the pelican, and a sea turtle she names Chicca. Nim, an avid reader of adventure novels, lives out her fantasies based on the tales of the hero in her favorite books by novelist Alex Rover. Nim visualizes the author as a courageous and larger than life hero, much like the main character in the books. Nim emulates this adventurer in her day-to-day island activities along with her friends, often holding imaginative conversations with him when needing a boost of courage. Nim’s father sets out one day on a scientific boat trip in search of a new species of plankton he plans to call protozoa nim. He intends to take Nim along, but she tells him that she must stay behind to look after the hatching of Chicca’s eggs so she can protect them from dying. He agrees to this since he will only be gone for two nights and they will be able to communicate using the satellite phone. While her father is away, Nim, reads an email her father receives from Alex Rover, the author, inquiring about an island volcano she’d read about in one of Jack’s National Geographic articles. She is in search of an exciting ending to her most recent novel, and believes this to be an interesting possibility. Unlike the heroic character she writes about, however, Alexandra “Alex” Rover is a neurotic and agoraphobic petite woman, afraid of everything! Alexandra hasn’t been able to leave her apartment in San Francisco in almost five months. An email exchange follows, between Alexandra and Nim, with Nim first pretending she is her father’s assistant. After three days without her father returning from his trip at sea, Nim tells Alex that she is really an 11 year old girl alone on an island, worried that her father may be in grave danger, or worse yet, dead. Nim is unaware that Jack has encountered a monsoon, that has left him shipwrecked, trying to repair the boat in order to get back. Nim goes on to tell Alex that she is also suffering from a huge cut on her leg that has begun to infect, and she implores Alex Rover to come help her. Alexandra, struggling with her agoraphobia, argues with the main character of her novels, who she also engages in conversations with. She tries to convince him, and herself, that she can’t possibly rescue Nim if she can’t even leave her own apartment! “Be the hero of your own life’s story,” he tells her, “trust is the secret to adventure,” and so she sets out to rescue Nim. Her journey to the South Pacific ends in disaster by the time she reaches the remote island, and upon meeting the little girl, leaves Nim devastated by the truth, that the hero who had come to rescue her, is the very one who needs saving the most. Together, Nim and Alexandra discover they are braver than they knew they could be, and also discover that it’s more important to be the hero of someone else’s story than the hero of your own. Nim’s Island is a delightfully touching, action-adventure movie based off of Wendy Orr’s book with the same title. Nim’s Island tells a story of courage and hope, and of overcoming one’s fears through the adventures of the story’s main characters. Nim Rusoe is played by Abigail Breslin, Gerard Butler plays both Nim’s father, Jack Rusoe, and Alexandra’s main character in her books, Alex Rover. And, Jodie Foster plays Alexandra Rover. This movie is a feel good tale to be enjoyed by all ages and genders alike filled with humor, an enjoyable cast, and beautiful island scenery. If other are curious what else is in store for Nim, they may want to read the book Nim’s Island and the sequel Nim at Sea. Other movies with characters finding their own strengths and courage with some aspect of fantasy or even the unexplained may enjoy Mr. Magorium’s Wonder Emporium about a magical toy store, or the supposed truth behind the Loch Ness Monster in The Water Horse: Legend of the Deep. Rowling, J.K. (1998). Harry Potter and the Sorcerer’s Stone. New York, NY: Scholastic. Harry Potter and the Sorcerer’s Stone is the first book in a series about an 11-year-old boy wizard named Harry Potter. His world contains people unaware about magic called Muggles and a hidden society of magic. As an infant, Harry was left with his mother’s sister and her family, Harry grows up not knowing about magic, the world of his parents, and is treated horribly by his relatives. He is teased by his cousin Dudley, called names by his Aunt Petunia, and is forced to live in a cupboard under the stairs by his Uncle Vernon. Yet, all is about to change as Harry receives an invitation on his eleventh birthday to attend Hogwarts, a famous school of magic, and the remainder of the book covers the attendance of his first year at Hogwarts School of Witchcraft and Wizardry. From the start of his journey, Harry is continually amazed by the new and unusual things he sees and learns, particularly the fact that he is a natural flying on a broom. Even more, as he continues to meet these magical people, he discovers new friends and family he never had. As part of his new world, Harry has to deal with its evil elements. There are those who hate the non-magical Muggles. One of the most notorious and recent was Lord Voldemort, the wizard who murdered Harry’s parents and tried to kill Harry as an infant. In fact, this led to Harry being famous in the magical world, where he is known as “The Boy who Lived”, and, Lord Voldemort has not been heard of since the murder of Harry’s parents. During the first school year, Harry Potter is curious about an item being hidden at Hogwarts, the Sorcerer’s Stone. Along with his new best friends, Ron Weasley, and Hermione Granger, they discover the location of the Sorcerer’s Stone with additional hints slipped by the school’s keeper of grounds, Hagrid. It is here that Harry battles an ally of Lord Voldemort, Professor Quirrell and even has a confrontation with the evil wizard himself. Lord Voldemort as everyone anticipated was dead has actually living off of the essence of unicorn blood. And as the first book (first year of school at Hogwarts) concludes, Harry has cemented wonderful relationships with friends and mentors (the headmaster Professor Dumbledore and the head of the Gryffindor House, Professor McGonagall), and is already excited for his second term (book two: The Chamber of Secrets). The Harry Potter series, beginning with Harry Potter and the Sorcerer’s Stone contains as much magic capturing the interest of the readers as magic within Hogwarts. J.K. Rowling has created a set of characters that you want to follow on their journey, as you cheer for them, laugh along with them, share in their wonder and magical lessons, and even experience their fright. J.K Rowling created characters in which readers of any age will easily be able to identify with whether they are Muggles or magical folk, and the settings are described in fluid detail that imagining such places comes with ease. Harry Potter and the Sorcerer’s Stone also created into a film that helped popularize the series even further. Most fans of Harry Potter and the Sorcerer’s Stone most likely will/have enjoyed reading Percy Jackson & The Olympians by Rick Riordan, The Spiderwick Chronicles by Tony DiTerlizzi and Holly Black, The Inheritance Cycle by Christopher Paolini, the newer series The Guardians of Childhood by William Joyce, His Dark Materials by Phillip Pullman, The Unwanteds by Lisa McMann, Children of the Red King by Jenny Nimmo, and Books of Beginning by John Stephens. Collins, S. (2008). The hunger games. New York, NY: Scholastic Press. Suzanne Collins begins The Hunger Games by introducing the reader to Panem, a dystopian society divided into 12 districts in the ruins of what was once North America. Katniss Everdeen, a 16-year-old girl, will learn that her actions alone can ignite change for a better future. She is from District 12, one of the poorer districts where food is scarce. We learn that Katniss has had a hard life after her father died when she was 11-years-old in a mining accident and her mother was unable to cope leaving Katniss to fend for the family. She taught herself to hunt illegally outside of the limits of District 12, how to barter her catch for food and goods with other traders at the Hob, and to inevitably keep her and her sister alive. Each year, Panem has an event called “The Reaping” in every District. The Reaping is for The Hunger Games. Every district picks two tributes, a boy and a girl by lottery that will literally fight for their lives. For the 74th Hunger Games, Katniss steps up and volunteers after her sister, Primrose’s name is drawn. Peeta Mallark is also chosen, the boy that once gave her bread for her family when they were starving. The two tributes of District 12 are sent to the capital of Panem, a plush luxurious place with as much food as one could eat. There they train for the upcoming games in which they learn to hone the skills they were born with. For Katniss it’s hunting with a crossbow in which her skill and accuracy are unmatched. For Peeta it’s his strength and ability to camouflage himself. Katniss’ partnership during the games with fellow tribute Rue reminds Katniss of Primrose and fuels a desire to protect her. When Rue dies it breaks Katniss heart and Katniss tries her best to honor Rue. That honoring of District 11’s tribute sparked anger and discontent over the games. The connection between Katniss and Rue may have helped start the rebellion that begins later in The Hunger Games Trilogy. The star-crossed lover story was cooked up by Haymitch, but to Katniss’ surprise she finds that Peeta’s feelings are true but not mutual. And, at the end of the games, rather than killing one another, Katniss and Peeta choose to consume poisonous berries so that the Game Makers will fail, resulting in the 74th Hunger Games without a victor. Because there must always be a victor, the two are allowed to live. Many believed their actions as an act of defiance, particularly President Snow who could foreshadow an upcoming rebellion as a result. Suzanne Collins’ The Hunger Games trilogy is immensely likeable. They were hard to read at times due to the violence but the story offers highly likeable characters in which readers will find themselves able to relate to one or more characters keeping them feverishly reading the series. Suzanne Collins successfully conveys Katniss’ sadness over her losses and her inherent strength to climb back out of her pain to cope with the next bad thing. Katniss does not live a life of illusion. She recognizes the ugliness in her world, her desire for change, but also her acceptance that this may be all she ever knows. Readers will learn a lesson that’s not metaphorical, or even the most inspirational, but what a reader may take from The Hunger Games is that making the best of a bad situation and finding a way to cope may be life’s only choice at times. And, even if the characters lack hope, the story is so compelling that the desire for success of these characters will have most readers believing they somehow can offer their strength and courage to aid Katniss and Peeta. The Hunger Games, and the entire trilogy offers a highly suspenseful and philosophical action-adventure with elements of romance in these YA novels that tweens will be eager to read. Other books that tweens may also enjoy that are set in dystopian futures and are specified as tween literature include, Among the Betrayed (Shadow Children #3) by Margaret Peterson Haddix, The City of Ember (Book of Ember #1) by Jeanne DuPrau, and The Unwanteds (The Unwanteds #1) by Lisa McMann.